PAUL JAY, SENIOR EDITOR, TRNN: Welcome to The Real News Network. I’m Paul Jay. We’re in Toronto. Joining us now to discuss the British elections is Leo Panitch. He’s a professor of political science at York University and author of the newly released book In and Out of Crisis. Thanks for joining us, Leo. LEO PANITCH, PROF. POLITICAL SCIENCE, YORK UNIV. : And the author of an old book, now ten years old, called The End of Parliamentary Socialism: from New Left to New Labour. That’s my basis for expertise on this question. JAY: Well, let’s talk about New Labour, because Tony Blair ushered in the third way and a new vision for the left, supposedly, in UK. It’s sort of ended ingloriously now with Mr. Brown. What do you make of what’s happening? First at the political level, then let’s talk about this whole ideology. PANITCH: Well, it’s significant. You know, Labour had a big, long run of 13 years, which is a very long run in British politics. It’s equivalent to what the Tories had, Conservatives had, from 1951-64. It’s close to what the Conservatives had from ’79 through ’97—not quite as long, but it was—you know, three successive elections is a big thing. So that’s come to an end. They presented themselves as finding the answer to the problems of free-market Thatcherite capitalism, but essentially what they did was embrace it. They embraced it and said, we will be slightly more socially conscious than Mrs. Thatcher was. But in fact they weren’t. They embraced the city of London and the banking system fully, including by taking a lot of money from them. Blair made a deal with Murdoch, Rupert Murdoch, who owns a good part of the press in Britain, especially The Sun, and bought into his law-and-order line. JAY: And just—I assume most of our viewers know, but just in case they don’t, this is the same Murdoch that owns Fox News. PANITCH: Who owns Fox. Exactly. The Australian newspaper magnate who owns large chunks of the Western media and bought himself an American citizenship in the process, ’cause it was difficult to own a major American news network if you couldn’t own one unless you were an American citizen. So he bought himself American citizenship. So they had a good, long run. They were very pragmatic. They presented themselves as having this philosophy of kind of an egalitarian market society, but it was one that essentially embraced the Thatcher revolution. It’s true that they spent more than Thatcher did, but they were able to show at the same time that Thatcher really didn’t reduce the state nearly as much as she claimed. She just shifted the state’s priorities around. They marketized the national health service—they didn’t privatize it, but they introduced the kinds of competition, demands for efficiency that you would get in a privatized health service. You know, there were some progressive things, like child tax benefit, which Britain didn’t used to have, which they borrowed from Canada. They came over here and looked at what the NDP and Liberals were doing with child’s tax benefits for families and introduced that. But it has proven it was temporarily successful. But in terms of increasing inequality in Britain, in terms of leaving Britain very vulnerable to the power of financial capital, in terms of vast regional inequalities, it has certainly not been a success in social terms, and they ultimately paid for it. JAY: And throw in a lying with George Bush on Iraq. PANITCH: Well, I was just about to say. Of course. And, you know, the thing that may have hurt them most in the end was the Iraq War, their supporters in particular, but not only their supporters. Unlike in Canada, the parents of the people who were sent to Iraq and Afghanistan are very angry with the government. Nobody is buying this patriotic stuff as the Canadian families who suffer from this are buying it. And that has, I think—was also a very major factor in the unpopularity of New Labour. Now, what is so interesting, however, is that there was not this rush to the Tories, especially not in the north, especially not in Scotland, especially not amongst Labour’s working-class constituency. There is this abiding fear and suspicion of the Tory party, more than there was, because a lot of working people did vote for Thatcher. But having seen what it represented, they don’t want it again. JAY: Now, why didn’t the Liberal Democrats do better? PANITCH: Well, it’s always the case, I think, with third parties. They get squeezed out when it comes down to election day. People often vote negatively—I don’t want the Tories, you know, I don’t think in my constituency the Liberal Democrats can win, so what I’m going to do is vote Labour. And I think that was the logic of the way things operated. And, you know, the Liberals are a media party in Britain. The more progressive media has always been Liberal Democrat. And, you know, they don’t want to be seen as socialist. They think that the Labour Party has historically been too tied to the working class and unions and so on. So the center-left media always pushes the Liberal Democrats, and I think that’s what happened in this context. When it was announced that [Nick] Clegg won the debates, well, who decided he won the debates? You know, it was journalists who decided he won the debates. JAY: Clegg of the Liberal Democrats. PANITCH: And he’s the leader of the Liberal Democrats. JAY: Now, at the time of some of the most critical points of the Iraq War, there was a significant section of Labour, with Labour even sitting members of Parliament, who had a revolt against Blair. We know the Downing Street memos came out. There was—it became very clear that the Blair government had essentially lied about what they knew about and such. PANITCH: Yeah, but not enough. It was astonishing how Labour MPs for the most part swallowed hard. And I knew many of them, and these were people who were, you know, leaders of the anti-Vietnam campaigns who swallowed hard and protected their backsides, hoping they would still get a junior ministry, which is what most of them—. I mean, you have to realize that these are careerists; these are people who often started out as student radicals, who ended up as Labour Party, and often, you know, as community activists, who then grew up, had a family, needed to do something with their lives rather than start community farms, ran for the Labour Party, got elected. And then, well, you know, you want to have influence and you want a larger salary, and they were bought by a very pragmatic and cynical Labour Party leadership that got elected by selling himself to the center-right media. You want us to say anything, we’ll say it. The left wing of the Labour Party that tried to transform that party into a really democratic, radical political force, which was the Bennite, the left-wing Tony Benn movement of the 1970s, it was rejected by those pragmatic people because the media painted Tony Benn as though he was, you know, the devil incarnate. JAY: So does this open up the defeat of Brown? Does this open up a space for a renewed struggle in labor? PANITCH: Well, yeah, we’ll see, but it could be a ruse as well. You know, in my view, it’s an illusion to think you can change the Labour Party, that you can turn, you know, a lumbering beast into a gazelle. The Labour Party will split before it will allow itself to be changed into a democratic, radical force in British politics. That was clear from Bennite times, when in fact a piece of them went off and joined the Liberal Democrats. 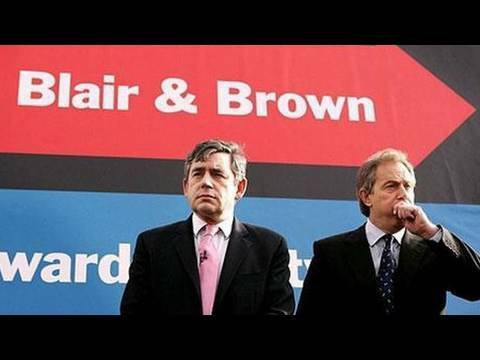 And I think there was a lot of illusions about Brown on the part of the left and the Labour Party. They thought that there was a big difference between him and Blair, whereas in fact you could, you know, barely put a piece of cigarette paper between the two of them in terms of their politics and their principles and their approach. And that became fairly clear along the way. And I think there’ll be an illusion now, especially if a more left-center cabinet minister is chosen, that he will be able to push the Labour Party in a more radical direction, which I think is very unlikely. So it may pull people back into the Labour Party and into an attempt to transform it again, which I don’t think is going to happen. So the more serious question, I think, is that if the Liberal Democrats out of this situation managed to get either the Tories or Labour to really commit to proportional representation, will that create space for the emergence, finally, of a viable new socialist party to the left of Labour? And you would need PR for that, as you’d need it in Germany, where the new left parties emerged [inaudible] operates and so on. And that would be interesting. It might not only be the Liberals who would benefit from that; it might be, hopefully, a new type of creative socialist party. But that remains to be seen.